Kits are available for each view: VIEW #1 - $35.00 (NOW ONLY AVAILABLE IN LAVENDER). Each kit includes a pattern and all material to create the dress as shown. The pattern pieces are cut out. 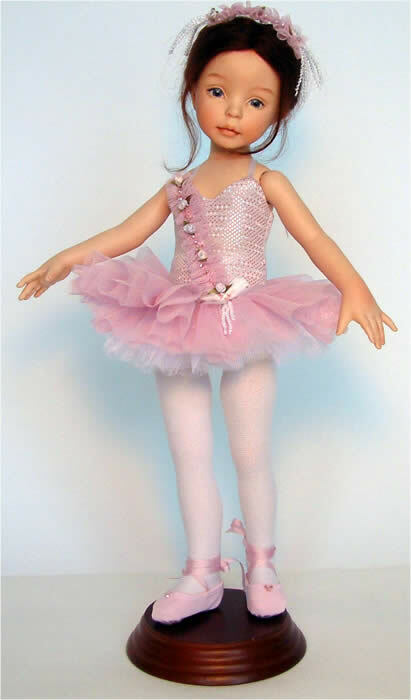 A pale pink lycra covered with tiny iridescent dots gives the leotard a shimmery look that is repeated in the pink iridescent glazed fine mesh that forms the top layer of the tutu. The underneath layers of the tutu are made from iridescent white tulle. The tutu is attached to a hip band made from the leotard lycra. The pink tutu mesh is gathered in narrow strips and embellished with tiny pearls, miniature roses, and bunches of curled mini trim to make the head and front pieces. White tights and matching pink ballet slippers complete the costume. 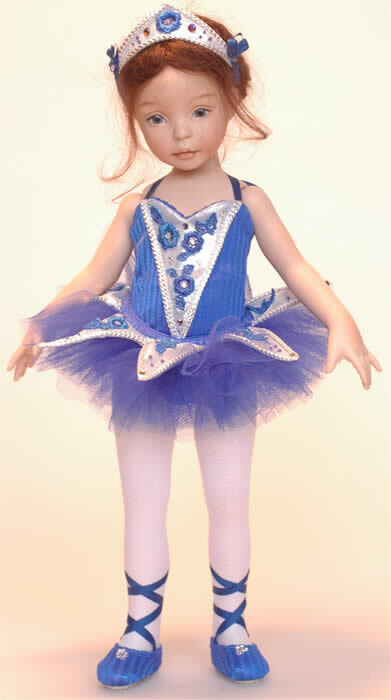 Royal blue lycra and tulle contrast with liquid silver lamé in this ballerina outfit. A silver panel trimmed with silver cord and cut out Venice lace motifs dyed Royal Blue adorns the leotard front. This motif is repeated in six points that encircle the tutu and in the headpiece. The silver pieces are all also embellished with tiny royal blue beads and iridescent volcano Swarovsky crystals that are glued in place. White tights and matching royal blue lycra ballet slippers complete the costume.